A few years ago, the owner of a new trawler visited the boatyard I manage. He sat in my office and dictated a moderately long list of improvements, modifications, and repairs that required attention. One of his minor complaints was that the engine-compartment door was sticking. He complained that when the engine compartment was hot, the door was difficult to open. I transcribed his complaint into the work order and didn’t give it any further thought, until the boat arrived at the yard a few weeks later and work commenced. The carpenter assigned to this task—an experienced shipwright and skilled craftsman—called my office to say that he couldn’t find anything wrong with the door, as it opened and closed without difficulty. “Did you test it with the engine room hot?” I inquired. He hadn’t, but this was my fault; I had neglected to note in the work order that the problem occurs only when the door heats up and expands. A few hours later, he called back: “It still works fine—opens and closes without any difficulty,” he reported again. I have a standing rule at the boatyard: If a customer reports a problem, our job is to find it—period. Writing “couldn’t duplicate problem” on an invoice simply isn’t allowed. We pride ourselves in getting to the bottom of hard-to-find or intermittent problems, and this engine-room door appeared to be a textbook example of just such a problem. The dialog continued: “The engine room’s good and hot?” I asked. “Like Tampa Bay on a July day,” he replied. “I’ll be right there,” I told the carpenter, as I walked down to the docks, intrigued by this challenge. Sure enough, the door opened and closed with ease. The fit couldn’t have been any better, nice and tight, as an engine-room door should be, but requiring virtually no effort to open or close. The joinerwork around the door showed no signs of movement. My first thought was that the wood hadn’t expanded during our trial run because the compartment wasn’t hot enough (the temperature in the engine room was about 100 degrees F) or because the humidity was too low. I endeavored to raise the temperature, but diesel engines are notoriously difficult to heat up when they aren’t under a load, and thus far, we’d only idled her up dockside. I started the two 400hp engines and throttled them up to 2000 rpm in neutral, donned a pair of headphones, and headed for the engine room…and that’s when I got my first clue. I could open the door, but only with difficulty. It appeared as if the owner was right, after all—it was sticking. As I placed my hand back on the latch, I noticed acool breeze around the lock set. Removing my ear protection and placing my face close to the handle, Icould feel and hear air being sucked through the doorjamb and hardware. The engine compartment was under a vacuum, but how could that be? I told the carpenter to throttle back, and as soon as he did so, I was able to open the door without any trouble whatsoever. With the door opened, I instructed the carpenter to throttle up to 2500 rpm once again. AsI slowly closed the door, I could feel it pulling asif it were on a spring retractor once it got within about 2inches of the jamb. We’ll return to that engine-room problem a little later on. Before doing that, however, a discussion on the importance of proper engine-room ventilation is in order. Beyond the obvious and above example—doors and hatches that are difficult to open when these compartments aren’t properly ventilated—there are a number of other important reasons to ensure that your engine and the compartment in which it lives are supplied with ample quantities of fresh air. A properly designed and installed engine-compartment ventilation system must be capable of fulfilling two primary responsibilities. First, it must maintain the temperature within the space at an acceptable level. Second, it must supply the proper quantity of combustion air to all engines within the space: essentially, propulsion engines and generators. While the need for these two roles may appear obvious, there are a few subtleties that are worth mentioning. The heat produced by engines that isn’t removed by the seawater cooling process (it doesn’t matter whether your engine uses seawater, a heat exchanger, and a wet exhaust or a keel cooler and a dry stack; heat is still transferred from the engine’s coolant to the seawater) is commonly referred to as “heat rejection to the atmosphere.” Additionally, engine-compartment heat may also be created by auxiliary machinery, such as air conditioning compressors, generators, and various electric motors and pumps. Additionally, the heat load on an engine compartment may be reinforced by the color of a vessel’s hull; black, blue, and green hulls will become considerably warmer than lighter colors. On occasion, I’ve measured hull temperatures as high as 180 degrees F where a dark-colored hull was exposed to several hours of direct sunlight. The degree of hull insulation (cored hulls offer excellent thermal insulation) will determine how much of a factor this becomes on engine-compartment temperature. Warm or hot air is less dense than cool air, which is why it rises. Hot, thin air, when mixed with atomized fuel, burns with less efficiency than cooler, denser air. 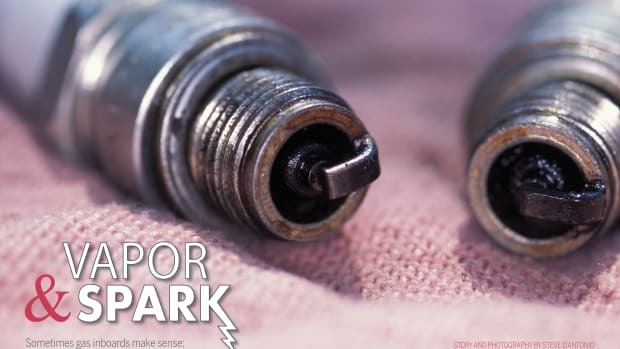 Cool air packs more molecules into the same space as an equal volume of hot air, and the presence of more molecules enables more fuel to be burned completely with each power stroke of your engine. This statement may be somewhat misleading; burning more fuel sounds like poorer efficiency, or does it? Notice, however, I said burned completely. When warm air is substituted for cool air in the internal combustion process, the same amount of fuel is injected into the cylinder, but the engine can’t burn it all because there aren’t enough air molecules to complete the proper fuel/air mixture. The decreased efficiency creates a vicious cycle. As power drops, or isn’t there to begin with, the operator attempts to compensate by moving the throttle forward, adding still more fuel to the mixture, which continues to burn incompletely. Thus, cooler combustion air enhances the efficiency of all internal-combustion engines, not just diesels. It’s why many over-the-road trucks use a snorkel-like device to draw in cool air from outside the engine compartment, and why many passenger cars and light trucks pull air through a duct from the grille or wheel-well area. The second component of the engine-compartment ventilation equation, supplying the correct volume of air to be used in the combustion process, is as important as the maintenance of engine-compartment temperature. Failing to supply an engine with the proper volume of combustion air is like placing a trash bag over its air filter, something you’d never dream of doing. The result is similar to the scenario of the hot engine compartment—incomplete combustion, diminished power, and excessive fuel consumption—but the severity of the problem may be many times worse, depending on level of air restriction. On large, higher-horsepower engines, the aforementioned heat rejection to the atmosphere may require more ventilation for its mitigation than the volume of air supplied to the engine for the combustion process. Both of these ventilation-related deficiencies—elevated temperature and excessive vacuum—are equally and critically important and must not be ignored where engine-compartment design and engineering parameters are concerned. An engine that is called upon to operate in an environment with excessively high-temperature or vacuum conditions will suffer from poor economy and reliability, as well as a shortened life span. will be compromised by long-term exposure to extreme heat. 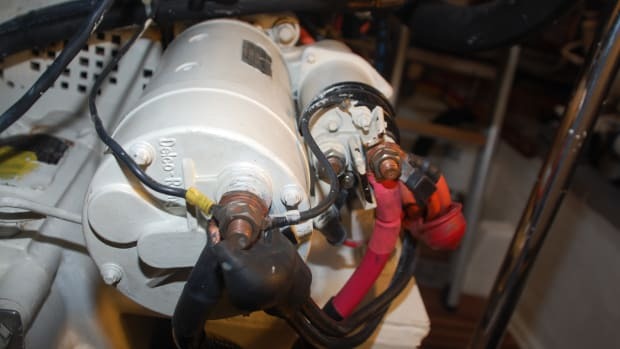 Although it’s possible for virtually any boat or engine installation to suffer from insufficient engine-compartment ventilation, it’s especially common in repowered vessels and in new boats whose engine horsepower has been increased since the initial design. The latter case is particularly incipient in that the builder or naval architect often does his due diligence, ensuring that the air supply is adequate for the chosen engines. However, as is so frequently the case, the builder, spurred on by customer demand, establishes options for larger, more powerful engines (this was the case with the aforementioned “sucking” engine room). This increase in power creates a need for increased ventilation; however, this component of the optional power package is often overlooked. The new engines operate, and the boat’s performance usually improves, but the efficiency is less than ideal because the higher-horsepower engines are starving for oxygen. The repower scenario often suffers a similar fate, whether by design or by default. Few vessels are repowered with a new engine that’s smaller or less powerful than the original equipment power plant. In many cases, the original engine-compartment air supply was already inadequate, but once the new engine—one that requires still more air—is installed, the configuration often enters a danger zone of almost certain failure: too much horsepower and not enough air. It doesn’t matter whether you operate a 30-foot displacement trawler powered by a naturally aspirated 50hp diesel or a 46-foot fast trawler equipped with twin 500hp, turbo-intercooled power plants; both need proper engine-compartment ventilation in order to operate at their highest levels of efficiency. It’s worth emphasizing at this point in the discussion that nearly every diesel engine will operate in all but the most grossly underventilated engine compartments. It’s not a case of whether the engine will run, but rather, how efficiently the engine creates power with the air it’s being provided for combustion and cooling purposes. and other equipment operating under maximum load. This temperature difference, notated by a Greek delta and often referred to as the “delta-T” (ΔT), is a logical approach to engine-room temperature control. If the vessel is operating in the tropics or in the Sea of Cortez, or if it’s cruising amongst the Windward Islands, it is only natural that the engine-compartment temperature will be higher than it would be in, for instance, a vessel operating in the waters around Newfoundland or western Canada’s Inside Passage. Cooler air and water temperatures always make for lower engine-compartment temperatures. Thus, a number of engine manufacturers mandate a maximum ΔT of 30 degrees F, or a difference of 30 degrees F between the air outside the vessel and the air inside the engine compartment. This means that regardless of geographic location, on a 90-degree day, the maximum temperature measured at the engine air inlet should be no more than 120degrees F. Lower is always better. Typically, the ΔT is defined as the difference between the air temperature outside the boat and the temperature measured at the air inlet manifold or turbo intake, with all equipment operating and the engine running at full rated load or rpm. For engines whose manufacturers don’t provide this information, consider the 30-degree ΔT as a safe, conservative figure by which to operate. As mentioned earlier, however, temperature is only a portion of the overall picture. The means by which this temperature is achieved, as well as the means by which a sufficient supply of combustion air is ensured, must also be calculated. Some guidelines calculate air intake by determining the surface area of the air-intake ports. One formula set forth by naval architect Dave Gerr determines the minimum vent area (in square inches) by dividing the engine horsepower by 3.3, then adding a 10-percent buffer. This is a figure that any boat owner can easily calculate without the need for special or sophisticated measurement equipment. Itassumes conventional louvers or grilles are installed over the openings, but if extensive ductwork is involved, the surface-area figure needs to be increased by 20percent instead of 10 percent. Another formula used to determine the minimum airflow through the engine compartment, measured in cubic feet per minute, or CFM, is derived by multiplying the engine’s horsepower rating by 2.75 and then subtracting 90. The previously mentioned formula for minimum vent area should provide for this specified CFM requirement. Gerr’s formulas also emphasize that more ventilation is always better, and thus, in addition to the 10-percent added to the original vent surface-area calculation, he recommends the addition of forced-air exhaust blowers that equal approximately one-third of the recommended CFM capacity. These forced-ventilation blowers should be wired to operate whenever the engine is operating, with the benefit of a relay. (Continuous-operation, heavy-duty blowers designed for recreational vessels typically draw as much as 10 or 12 amps at 12volts each, more than most ignition systems should be called upon to provide without a relay.) For example, given a 300hp engine installation, the cubic-footage formula (300 x 2.75 – 90) yields a ventilation requirement of 735 CFM, meaning that this installation would benefit from a 250-CFM exhaust blower, or one-third of the natural ventilation requirement. I concur with all of these calculations and have used them successfully on a number of occasions to provide sufficient engine-compartment ventilation. Before delving into the details and potential pitfalls of forced ventilation, however, it bears emphasizing that your calculations must include both propulsion and power-generation engines. If you don’t know or are unable to determine the horsepower of your generator or generators (if you have two and there’s a chance both will be run simultaneously, and at the same time as the main propulsion engines, then the collective horsepower of all engines must be totaled and used in the formulas), the rule of thumb specifies that horsepower is about equal to the genset’s kilowatt output multiplied by 1.5. The forced-ventilation protocol engenders a number of caveats. Primarily, it is important that, with a few exceptions that will be mentioned in a moment, engine-compartment blowers always be installed so they exhaust, or pull air out of the engine compartment rather than forcing it in. Although this may appear illogical, since the goal is to supply as much ventilation and combustion air to the engines as possible, the reasoning is sound. If a blower is set to draw in air from outside the boat, forcing it into the engine room, the barometric pressure within that space may become positive, essentially pressurizing the engine compartment. Again, one may ask, what’s wrong with this—more air is better, right? In this case, no: Pressurizing an engine room often leads to unpleasant odors being driven out of this space and into the rest of the boat. Ideally, the air pressure within the engine room should be neutral to slightly negative (the preferred engine room air pressure is 0 to –0.25 inches of water column, measured using a water-tube manometer). Other systems are completely automatic, allowing less room for error in their operation. One such system, manufactured by a company called, appropriately enough, Delta “T” Systems, of Riviera Beach, Florida (561.848.1311, deltatsystems.com), will automatically control the atmospheric conditions within an engine compartment. Sensors in the Delta T system determine ventilation needs, triggering and controlling inlet and exhaust blowers as they are needed. This is truly a set-and-forget engine-compartment ventilation system. The most important aspect of any forced-ventilation system—whether it’s manually or automatically controlled, whether it utilizes just exhaust or both exhaust and inlet blowers—is balance. It is critically important that the engine-compartment pressure be maintained at a near-neutral level. Manual, semiautomatic (timer-equipped), and fully automatic engine-compartment ventilation systems can and should be used to cool off the engine room after the engines have been shut down. Interestingly, engines often become hotter for some time after they have been shut down, because although combustion is no longer occurring, an instantaneous loss of cooling water occurs when the engine stops operating. The advantage to the semiautomatic and fully automatic ventilation systems is that they can operate without the need for crew supervision. For example, when you make port, you may leave the vessel with this system operating, knowing it will shut down after a preset time or when the engine compartment has cooled off to a preset level. All forced-ventilation systems, regardless of design, must use fans or blowers that are designed for continuous operation. Small, inline blowers (usually tubular in shape, with hose connections at either end) made for short-duration bilge ventilation simply are not designed for this type of service. Heavy-duty centrifugal or “squirrel cage” blowers (the type that use a device resembling a hamster exercise wheel) are designed for continuous operation and thus are well suited for forced engine-compartment ventilation. Fans employed by fully automatic systems such as Delta T’s may be axial as well as centrifugal in design. The axial design looks something like a window fan that uses a propeller-like fan. That, however, is where the similarity ends: Continuous-duty axial fans are designed to move vast quantities of air for extended periods. It must also be borne in mind that if a forced-ventilation system fails, be it automatic or manual, and the engine relies on this air to run efficiently while maintaining the proper ΔT, then appropriate measures must be taken. If this failure should occur, the vessel may have to be operated at reduced throttle until repairs can be made. The location for engine-compartment air-intake louvers or grilles must be given considerable thought. If they are not properly designed or located, they may not only admit too little air, but also allow the entry of water. Air intakes located on the hull below the toerail should be equipped to deal with the occasional dousing by beam seas or even momentary submersion during a heavy roll. Ideally, hull-mounted intakes should be designed much like a dorade, a device that allows the passage of air, but not water. This clever design takes advantage of the fact that air can be made to travel up and over a baffle while water typically will not take such a circuitous route. Water that enters the dorade must be allowed to quickly drain overboard rather than into the engine room. For intakes located at or above the deck level, water ingestion is of less concern, but it must still be considered. The vent design still should incorporate a dorade of sorts that will prevent the boarding sea from dousing engine, genset, or electrical gear located beneath it in the engine compartment. Intake louvers must contend with sea spray as well as solid water. In many cases, salt-laden spray ingested into these vents will deposit itself throughout an engine compartment, accelerating corrosion and rust, and also will be ingested into the engine (another reason not to use forced ventilation to draw air into engine compartments unless the system is designed specifically for this purpose). Neither of these scenarios is desirable, and thus, where possible, intakes should be located outside the normal spray range, or they should incorporate air/mist separators. Once again, Delta T Systems offers just such a product, an “Air Mist Eliminator,” that forces intake air to make a sharp turn to enter the engine compartment. Because water is denser than air, the rapid turning action causes the water to be slung out of the air stream, where it’s deposited into a gutter. This impingement type of water-separation process, called “hook and vane” by Delta T, is designed to separate intake air from water mist rather than from solid slugs of water. If the latter proves to be the problem, then the vents either will require a more substantial dorade, or will need to be moved to a higher location. An additional thought on intake-air design and installation that is worthy of mention concerns placement of ducting. Ducting is sometimes necessary to get the intake and exhaust air to and from the locations in the engine compartment where they can do the most good. Although it’s not always practical, inlet air, whether forced or passive, should enter the compartment low, while exhaust air should exit high and at the opposite side of the compartment. This creates the desired cross-flow, both vertically and horizontally, across the engineering spaces. A cross-flow will facilitate the greatest degree of heat removal while maintaining an even temperature, to the degree that this is possible, throughout the compartment. 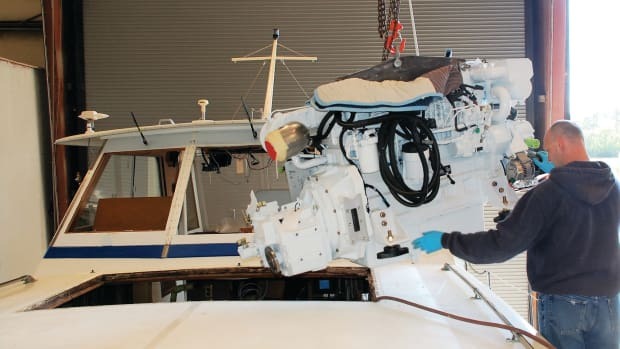 Many boatbuilders strive for complete separation between the bilges of the engine compartment and those of the remainder of the vessel in order to prevent the migration of water and other fluids, as well as odors, throughout the vessel. If, however, the vessel’s bilges are common—that is, air moves freely and is unrestricted by continuous bulkheads through the bilge compartments—then drawing some of the engine-compartment air through these spaces is desirable. Copious airflow through the bilges discourages the growth of mold and the associated odors. While it may not be practical to draw all engine-compartment ventilation through the bilges (this air ultimately is supplied by the cabin’s ventilation, ports, hatches, ventilators, etc. ), any airflow in this region should be considered beneficial. As far as the engine room that “sucked,” the solution was relatively simple. It seems the builder had increased the size of the engines in order to improve performance, but someone forgot to include the required ventilation-intake calculation as part of the upgrade. As a result, the new engines simply couldn’t breathe. Increasing the vent surface area solved the problem. For the purposes of this article, I won’t use the real engine configuration; let’s say, however, that they were twin 500hp diesels. That means the required vent area would be calculated by dividing 1018hp (including a 12kW genset), by 3.3, then adding 10 percent. The result is 339 square inches of intake, or a little under 2.5 square feet. The existing intake was approximately half this figure, which resulted in the stuck engine-compartment door. The engine compartment, and the entire boat, for that matter, was exceptionally well and tightly built, and thus, air could not be drawn in from anywhere but the intake vents—and the door, when it was opened. 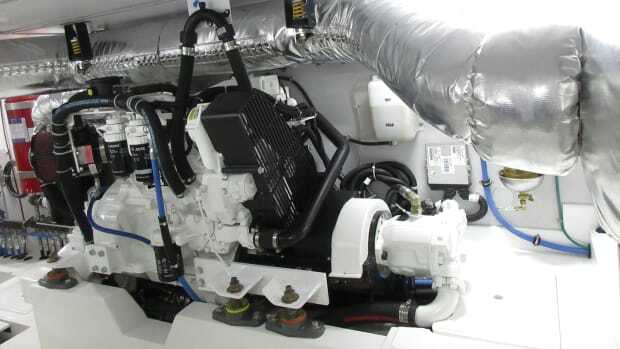 Although gasoline-powered engines are rare on today’s trawlers, for those that do fall into this category, bilge ventilation is not only important; it’s mandated by federal law. (A cup of gasoline, in a vaporized state, has the explosive power of a stick of dynamite.) If your vessel is powered by gas, ensure that your bilge-ventilation system is installed, used, and operating properly. Evacuation of flammable vapors from bilges requires, once again, that air be drawn out of these spaces, never forced into them. Because gasoline vapors settle, blowers used for this purpose should be ducted from the lowest part of the bilge. While nearly all blowers sold for the marine market today are ignition protected (meaning they will not ignite flammable vapors), it’s worth ensuring that yours are, too—particularly if yours is an aging vessel. Gasoline vessels aren’t the only ones that require bilge ventilation for reasons of safety. Vessels equipped with LP gas stoves, ovens, or heating appliances must also have provisions for evacuating flammable vapors from the bilges. LP gas, like gasoline vapor, is heavier than air, and thus, it, too, will settle in the nether regions of a vessel if a leak occurs. Once again, an exhaust blower installed to contend with this type of scenario should be ducted from the lowest area of the vessel’s bilges, and it must meet all the safety and ignition-protection requirements as do those used in gasoline applications (the blowers used in these applications are identical). For vessels equipped with gaseous engine-compartment fire-suppression systems (formerly Halon; now its replacements, FE-241 and FM-200), certain protocols and guidelines must be observed in order to ensure maximum effectiveness. The effectiveness of these gases is based on their ability to remain for as long a period of time as possible in the compartment in which the fire has occurred—certainly until the fire is fully extinguished. If they leak out or are forcibly ejected, their effectiveness is substantially diminished. In order to ensure that these fire-suppression agents work when called upon to do so, their installation must include interconnections between all engine-compartment ventilation components, as well as between these and the propulsion engines and generators. Under some circumstances, a diesel engine will continue to operate even when its combustion air is displaced by a fire suppression agent, such as Halon, FE, or FM. Because an internal-combustion engine is in effect an efficient air pump, it will ingest and exhaust the fire-suppression agent while continuing to run, reducing the time the agent remains in the engine compartment. Thus, fire-suppression systems must be designed to automatically shut down engines and generators without any action being required on the part of the operator. Additionally, these systems must also be wired to all forced-ventilation blowers, including those that are intermittently used or manually activated, as well as blowers used for cooling dry exhaust stacks. Interconnection systems are readily available from engine-compartment fire-extinguisher manufacturers, although their installation requires a clear and thorough understanding of engine, ignition, and vessel electrical systems. The inter­connection systems should be tested annually to ensure they are operating properly. A final thought on fire suppression and engine-compartment ventilation involves the use of engine air intake dampers. These are essentially doors that are designed to close over intake vents in the event of a fire. This action serves two purposes: It prevents air from being drawn into (and thus feeding) the fire, and it prevents the escape of a gaseous fire-extinguishing agent. If installed, these louvers must also be interconnected with the fire-suppression system. When the fire extinguisher is discharged (either manually or automatically), a properly installed system will shut down the engines, gensets, and blowers and close the intake vent louvers. Proper configuration of engine-compartment ventilation is a necessary part of every vessel’s design. It’s no less important than any other vital system, such as AC and DC electrical, fuel-distribution, or seawater-intake systems. If the necessary calculations and correct installation procedures are carried out when the ventilation system is installed, maximum engine efficiency and longevity, as well as reliability and safety, will all beachieved.